Kindergarten is different from preschool in so many, many ways. He’s gone for twice the amount of hours per day. There’s homework. He’s dog tired when he gets home. But, the biggest difference for me as Mom is: lunches. Lots and lots of lunches. Now, we could shell out the measly $3 a day for hot lunch, but that adds up. And if they’re serving something he doesn’t care for, then there’s no guarantee he will actually eat lunch. So, at least for now, I’m packing his lunch. It’s hard to think of different lunch box combos and ideas every single day of the week. I mean, I have read countless blogs that are heavily focused on creative non-sandwich lunch ideas for kids. And I’ve studied them and pored over them. I think I’ve gotten the gist of it. But I can’t always have all of those foods on hand at my disposal every morning. Usually I have a couple kinds of fruit, some crackers, maybe some meats and cheeses, and dinner leftovers (provided he actually liked and deigned to eat that dinner). And I mix and match all week and then try to get something different for the following week. Even though I’m trying my best to give him variety, he’s still got a touch of the pickies, and we don’t go through food fast enough for me to have a zillion different options on hand all the time. So, I know he’s getting a little burnt out on certain stuff. I usually stick one of his water bottles in there with just water in it, because milk will get too warm, he can’t have the amount sugar in a juice box (it affects his behavior), and soda isn’t allowed (not that I’d even give him soda at all, but you know, not an option). 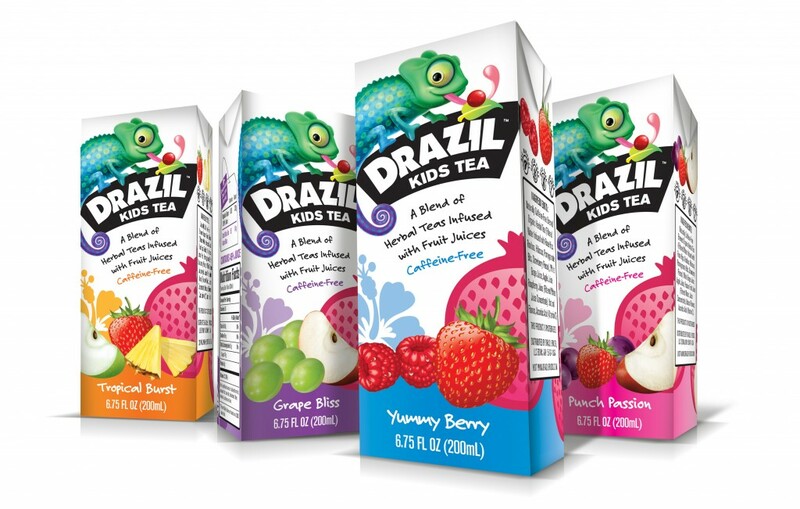 So, I was so excited to discover Drazil Kids Tea. It’s got a healthy tea blend of Hibiscus, Rose Hips, Rooibos, Pomegranate, and fruit pieces, with a touch of juice for flavor (35% less sugar than a juice box), and best of all they come in easily packable individual serving sized boxes, like boxed juice. It’s packed with antioxidants, vitamins and minerals, has no added sugar, no artificial flavors, and is caffeine free. Bowie is a big fan of tea, he drinks all kinds of it all the time. When he was small, he would find my cups of cold Earl Grey around the house, abandoned and/or forgotten by me, and finish them, and then ask for more! So, I knew these would be right up his alley. I toss them in two or three days a week. I vary it so he’s always pleasantly surprised, and it adds a little bit of fun to the monotonous packed lunch. Once in a while he will even thank me after school for putting one in his lunch. Drazil is available in markets across Northern California, and is also available on Amazon.com. It’s a great, delicious, nutritious way to add a little variety to their day. I approve. And so does Bowie! 1. Leave a comment below with your favorite lunch time ideas for kids. 2. 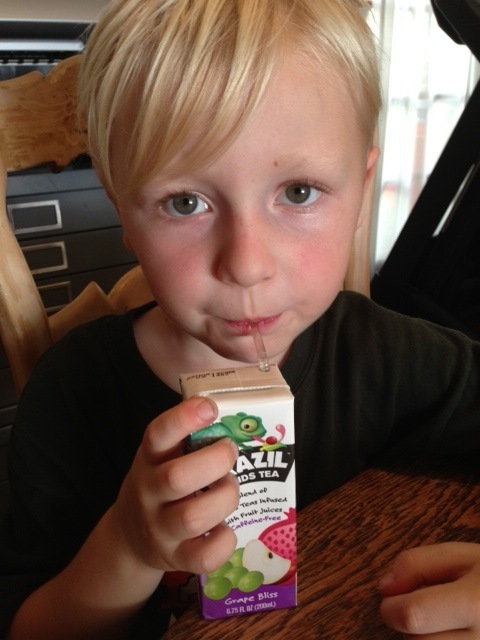 Head to Facebook and “like” the Drazil Kids Tea page. I was compensated for this post by Drazil Kids Tea, but all opinions are my own.